One in three Italian families does their shopping here. Conad is currently the largest supermarket in Italy*. It closed the year 2016 with a turnover of EUR 12 475 billion, i.e. a 2.6% increase compared to the previous year, and thus distanced itself from other players on the market. 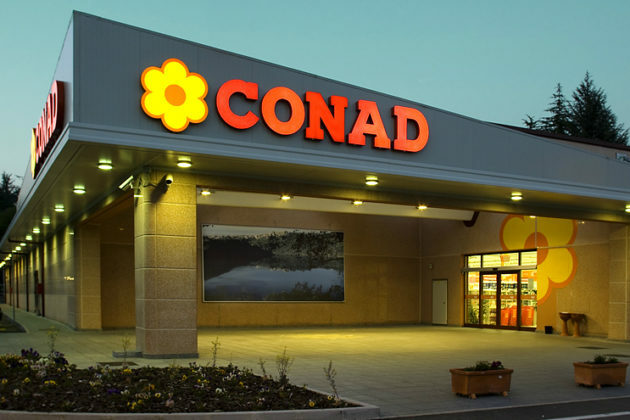 Conad is not only a sales leader in Italy. It is also the undisputed champion of good communication. With 3 088 shopping outlets of various sizes and formats (as of December 2016), the brand has been successfully increasing its sales for several years, thus becoming the main retailer in the country**. Conad is not just food, though. It is also an active promotion of specific consumer attitudes. 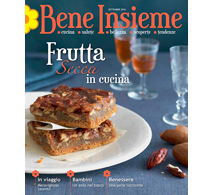 Ecology, quality and “Italianness” are values ​​that make up the image of this supermarket. Pharmacies, pet stores, optician stores, traditional or premium product stores (Sapori & Dintorni) as well as petrol stations are opened under the brand name. Apart from Italy, Conad is successfully developing in other countries, such as Albania, China, San Marino and Malta. The retail chain plans to invest EUR 292 million in development in 2017. EUR 37 million will be spent on communication, of which 15% on the development of digital channels and the e-commerce platform. 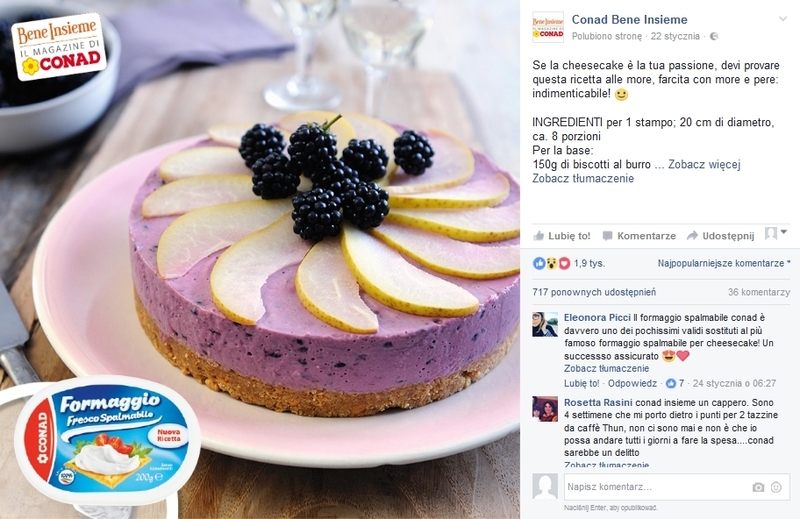 Conad is Italy’s undisputed leader when it comes to valuable content. Store communication is based on the on- and offline platform and is consistent in each of the used channels. Conad has mastered the art of talking about food to perfection. See for yourself how it did it. 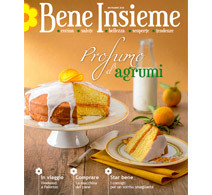 The trademark of the store chain, “Bene insieme” magazine (in free translation: “well together”) is a monthly available in stores across Italy. 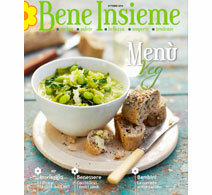 The magazine is primarily a culinary guide, with seasonal recipes for the whole family. Conad has been consistently conducting its custom policy for 7 years. Over that time, the magazine has evolved substantially, building a loyal group of readers. It has a simple and friendly layout, built on warm, familiar associations. 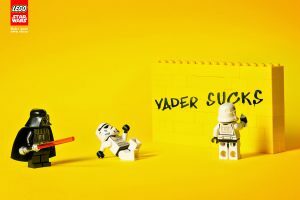 It includes large pictures, colorful illustrations and graphics, as well as contextual advertising and non-intrusive packshots. The magazine is perfectly suited to the target group and easy to read. The brand’s community gathered on FB currently consists of 430 986 members. Compared to the top largest retail chains in Italy, such as COOP with 53 935 fans, Esselunga with 303 430 fans or even DESPAR Italia with 16 608 fans, Conad is leading in the statistics. It is worth adding that, e.g. the COOP network offers a much wider range of products, which makes Conad’s results look even better. What immediately draws attention is the friendly and ingenious way to build involvement through content. Communication is based on 4 types of posts, which are graphically consistent and concern specific information, mainly related to the culinary art. 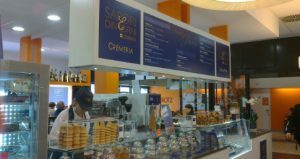 first is the presentation of ready-made meals (dessert, dinner, breakfast, etc. ), along with an indication of the packshot of the product, on the basis of which the dish can be prepared. It is a simple but very aesthetic and non-intrusive way to pursue sales and image goals. The next group of posts are the properties of a given product presented on illustrations and graphics. Properties don’t always concern nutritional values, but also tidbits, places of origin, i.e. expanding the context of a given product beyond the simplest culinary topics. Another idea for the promotion of certain food products implemented by Conad is to present them in the form of a guessing game. The community guesses which product is missing to create a specific dish. Yet another way for this type of communication is to involve the community in the selection of the product on the basis of which the next recipe will be prepared. With 3 products from a similar category to choose from, the comments are decisive. 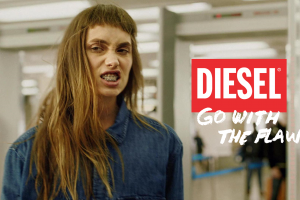 The “Scegli tu!” format, which means “You choose”, is also implemented by many brands on the domestic market, e.g. by Lidl on YouTube. 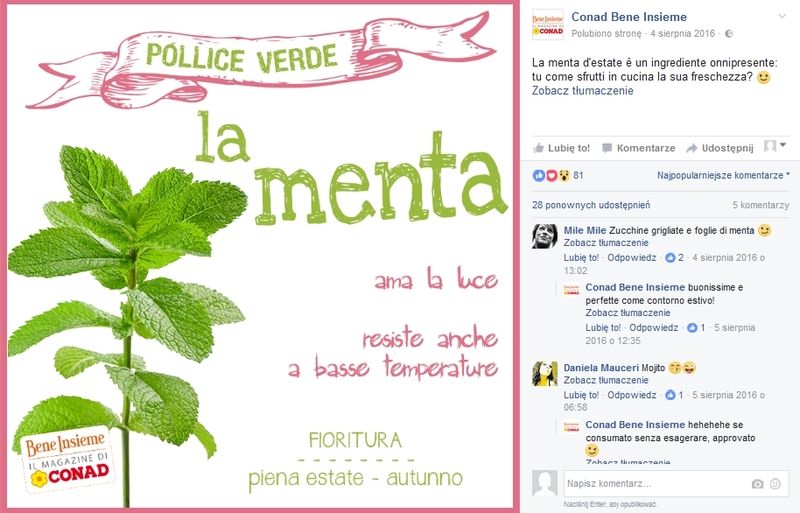 Conad is truly good at communicating on social media. Communication on Pinterest does not stray from this standard. 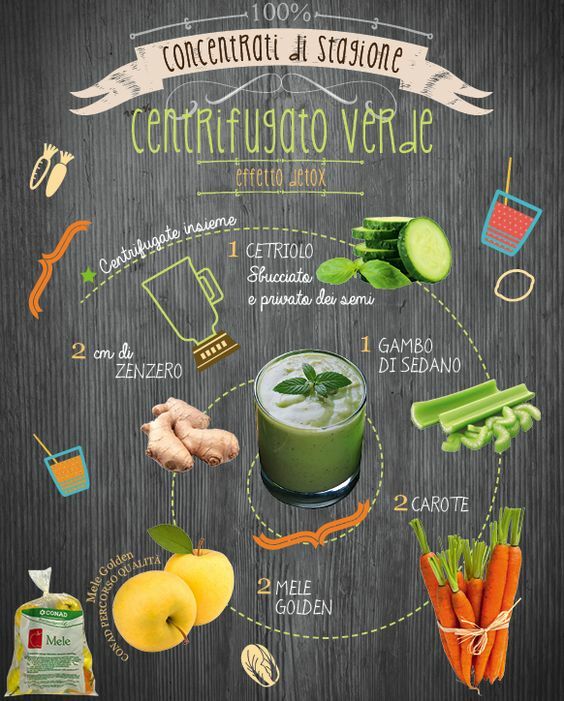 There are re-posted graphics from FB and specially prepared cycle “Recipes in infographics”, presenting selected recipes in an aesthetic way. The attractive composition of the infographics is consistent with the graphic composition of the magazine. Together they create a friendly, family-like and warm image of the Conad brand. 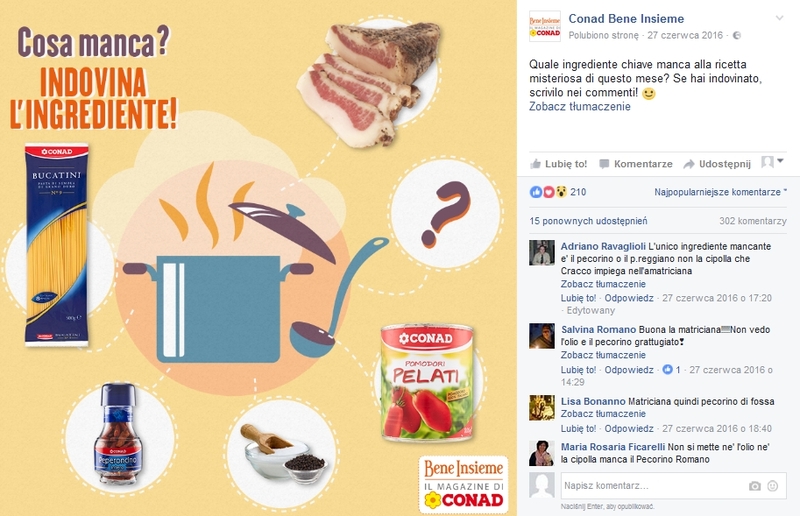 When preparing video content, Conad also reaches for interesting formats, not following the most-popular paths. Animations from the “Bassi e Fissi” series, which means “low and fixed” (meaning: product prices), are about 30-second videos presenting a witty dialogue between products. The animated food products compete to find out which of them has more nutritional value. They also point out their rivals’ disadvantages, so the dispute, presented as a ring fight, is fierce! An example of such dialogue is the conversation between a cup of coffee and a glass of milk. 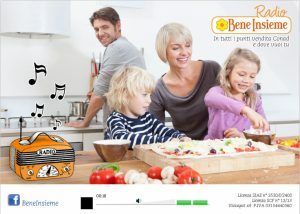 On the website http://www.visiospot.it/radiobi/beneinsieme.html you can listen to the store chain radio. In addition to the music “perfect for cooking”, interweaved with well-known Conad jingles, broadcasting time is filled with tips for healthy nutrition and supplementation. In addition to the very suitable and consistent, multi-channel communication, Conad is very keen on promoting its own brands. A good example is “Verso Natura”, meaning “towards nature”, brand, created in the second half of 2016 which includes BIO, ECO and VEGE products and supports the so-called “responsible consumption” and conscious customers. Conad has created a subdomain conad.it/versonatura/, where customers can find useful information about products and nature-friendly lifestyle. The premium brand Sapori & Dintorni (“Flavors and Neighborhood”) has an equally attractive design. The branding of this sub-brand is distinctive, boasts an artisanal approach to food production and aims for “Italianness” – the availability of local products. The promotion of this brand is being conducted primarily through the in-store promotion. 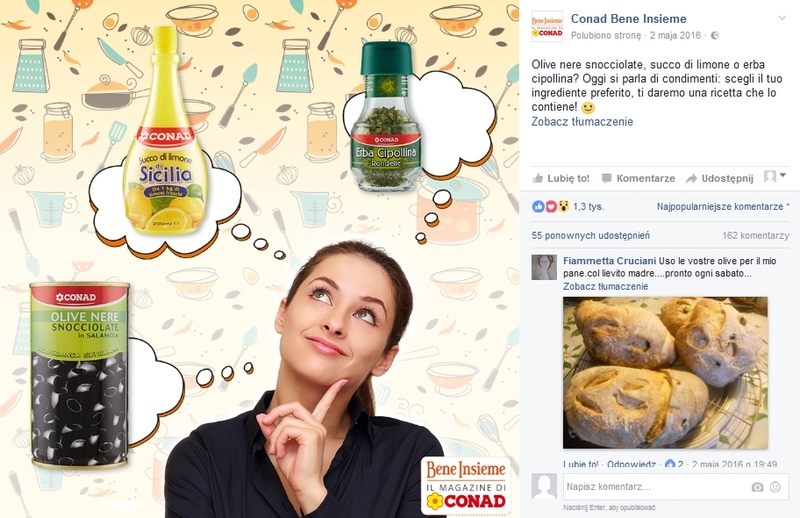 Conad communication is multi-channel, consistent and creative when it comes to ideas and their implementation. Adding to this good location of stores, attractive loyalty programs and gifts for regular customers (calendars, coloring books for children, planners, etc. ), the success of the store chain can be considered a synergy effect of many well-thought-out elements. 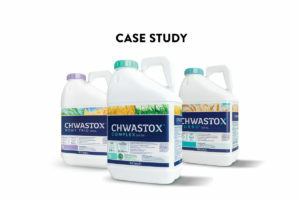 Chwastox brand campaign (Ciech Sarzyna). Case study.